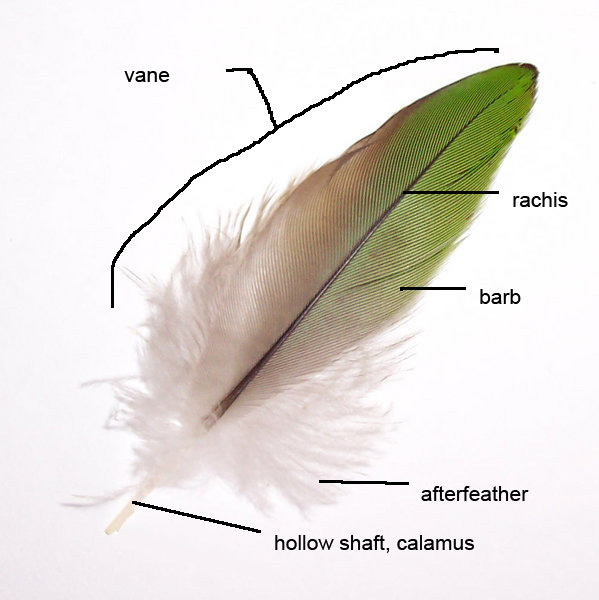 Note: At the end of this blog there are diagrams identifying the different parts of both wing and feather. For ease there is nothing better than a fountain pen or a biro, but sometimes you want to capture the essence of mark making. When you want to return to basics then using a very basic dip pen is what you need to use. This can be as crude as a stick, embellish it by sharpening. 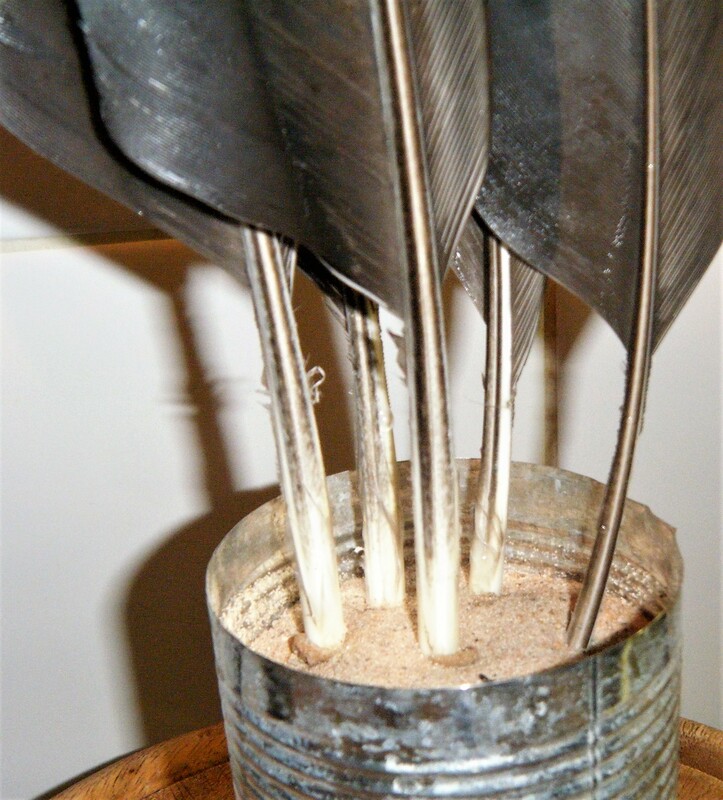 Further embellishment can be done by utilising other materials such as bamboo, reed or a feather. If using one of these implements then prior to use you generally have to do some preparation of the implement. 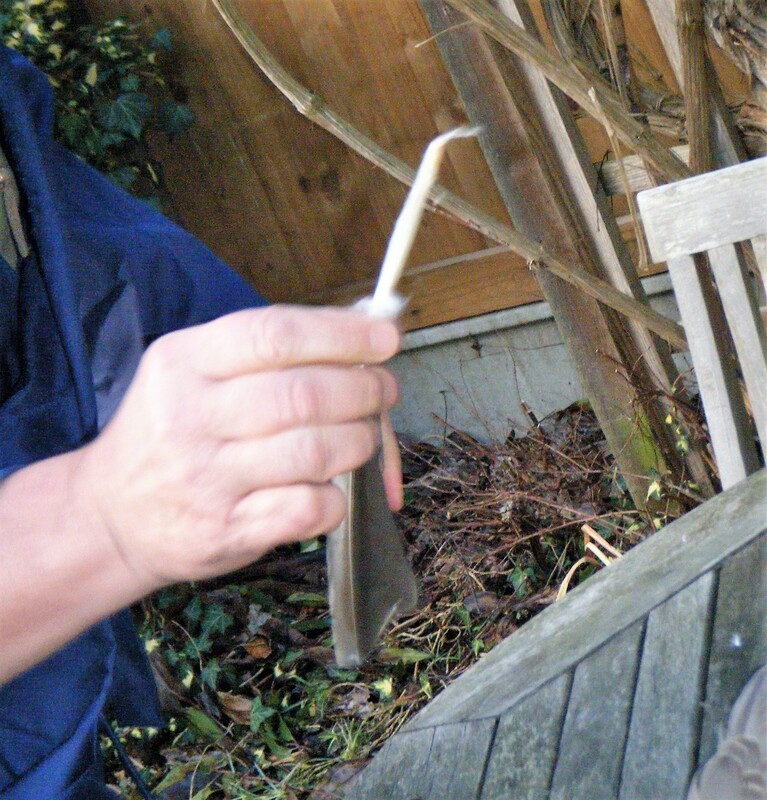 In this blog I will describe the steps I took to make quills using goose feathers. 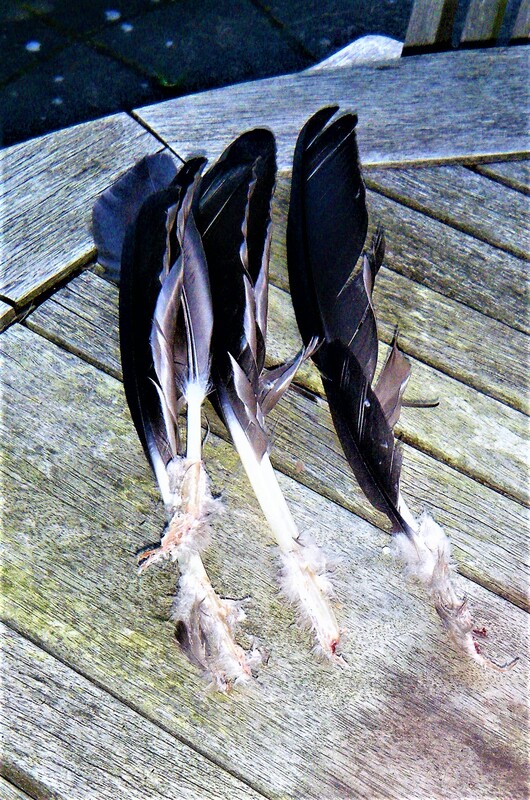 Obtain a feather, or feather or even a whole wing. 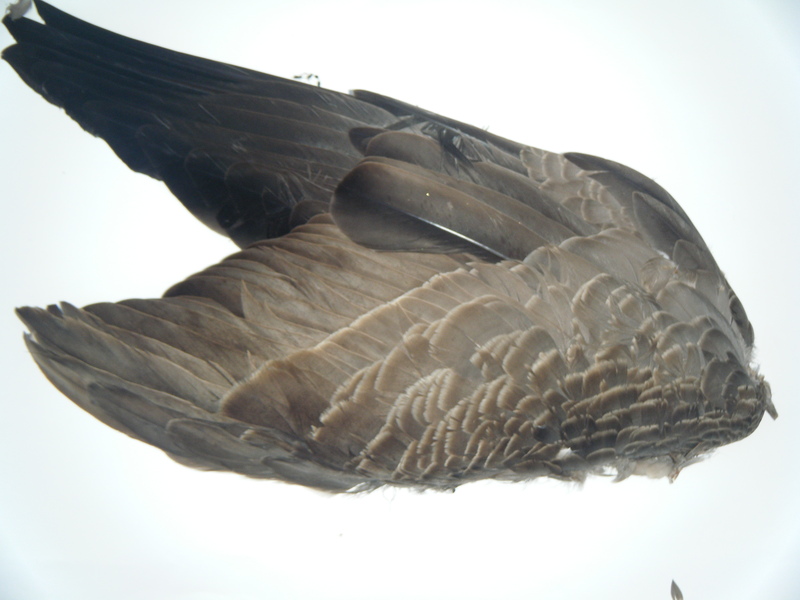 The feathers on this goose wing which will best suit being quills are the long feathers towards the tip (primaries) (upper left in this photo). 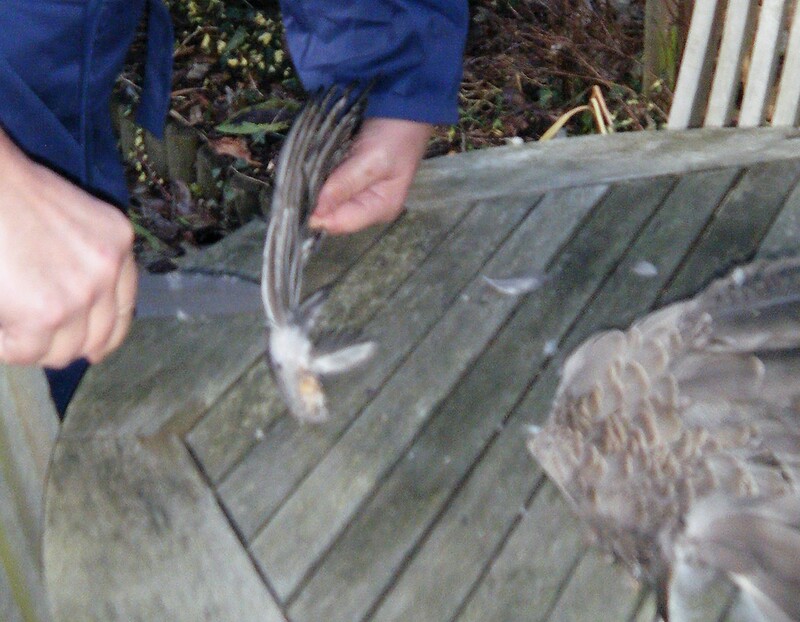 Remove the larger wing tip feathers as a block. 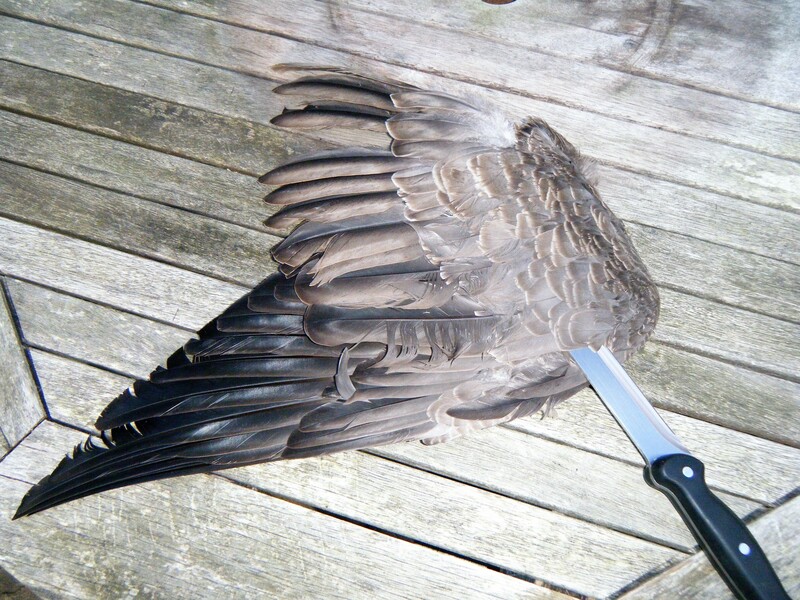 Cut own along the bone wing. Apply enough pressure to cut through the cartilage etc. 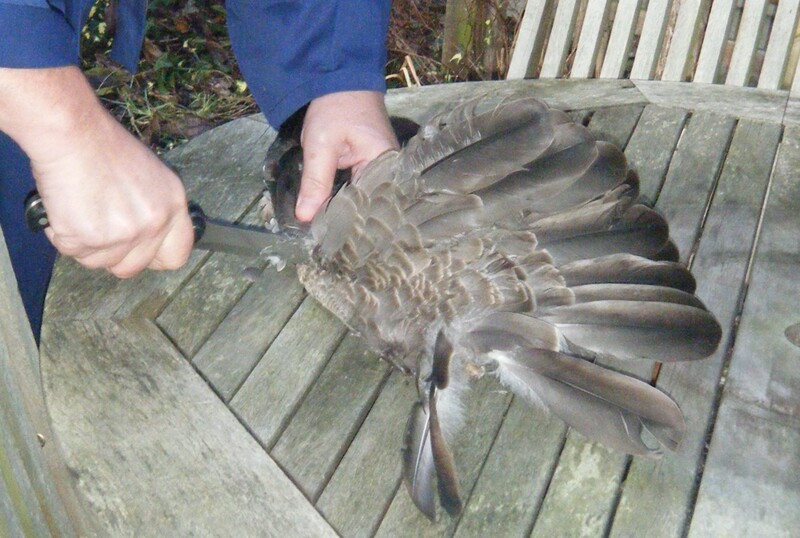 Each feather will eventually become detached with some tissue attached. This will be a mix of skin, cartilage a membrane etc. 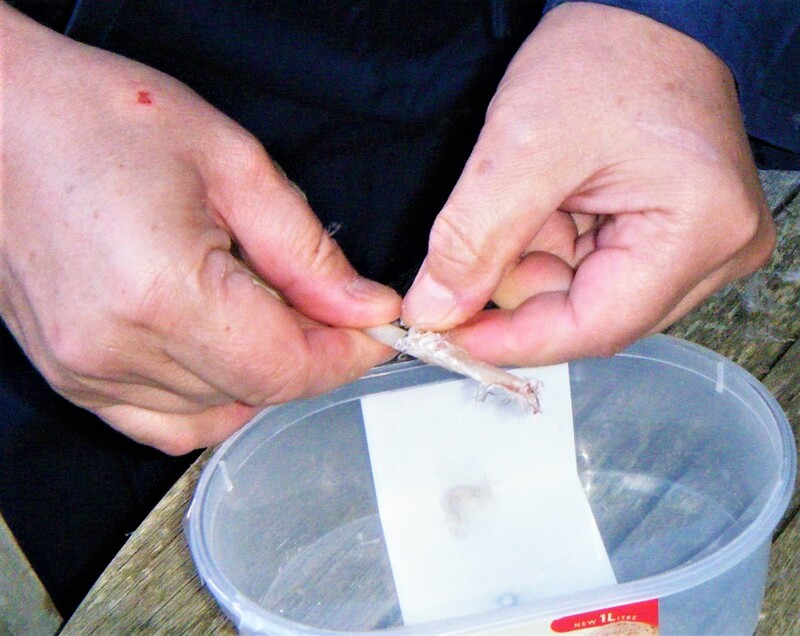 Remove all this tissue until you have a clean feather shaft (calamus). Then trim the feather barbs to leave at least half of the calamus clear. 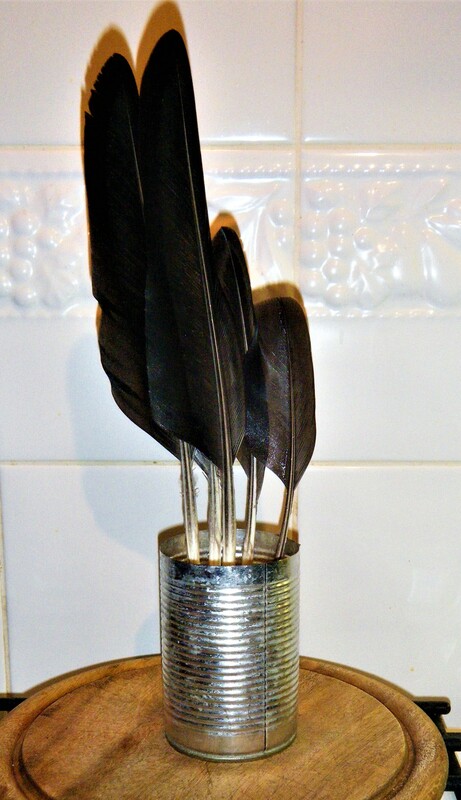 The quill with barbs still attached in more of a Hollywood invention. In times past all the barbs were generally removed and the quill was more the size of a modern day biro than something two foot long. ¾ fill a tin can or other heat resistant vessel with sand. (the finer the sand the better. Heat the tin can with the sand in it for at least 30 minutes in an oven at approx..170 degrees C.
Carefully remove from oven and push the feathers into the sand to a depth of several inches. Leave the tin and sand to cool for an hour or two. When pushing the feather into the sand the calamus often bends at the tip. This will need to be trimmed off and the tip shaped to become a writing point. When pushing the feather into the hot sand the calamus may have buckled. This needs to be trimmed from the tip and the tip shaped. 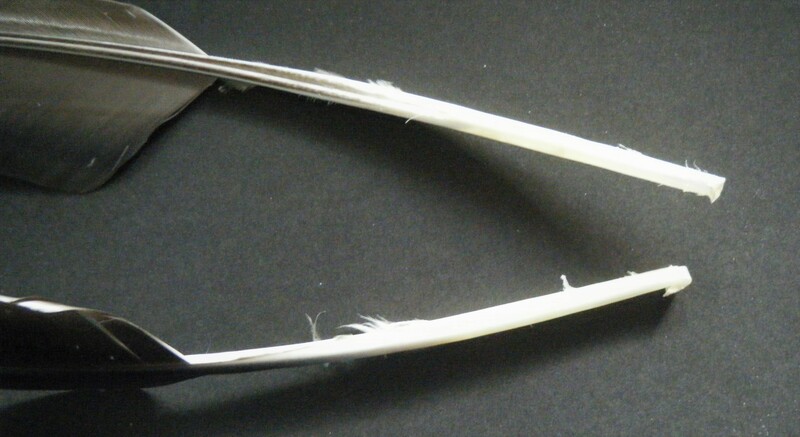 Using a sharp knife or blade make a long diagonal cut to tip of the calamus (feather shaft). 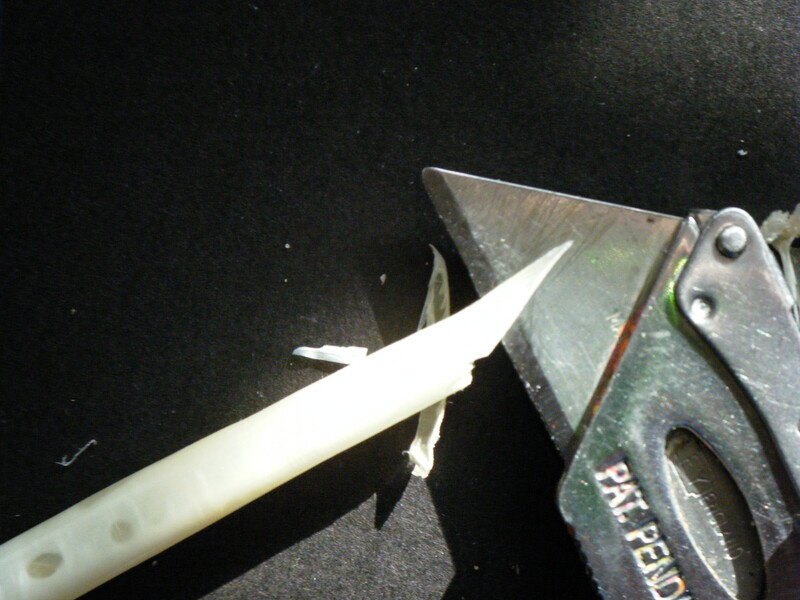 You can cut a flat tip to the quill if you wish to have a broad tipped nib. 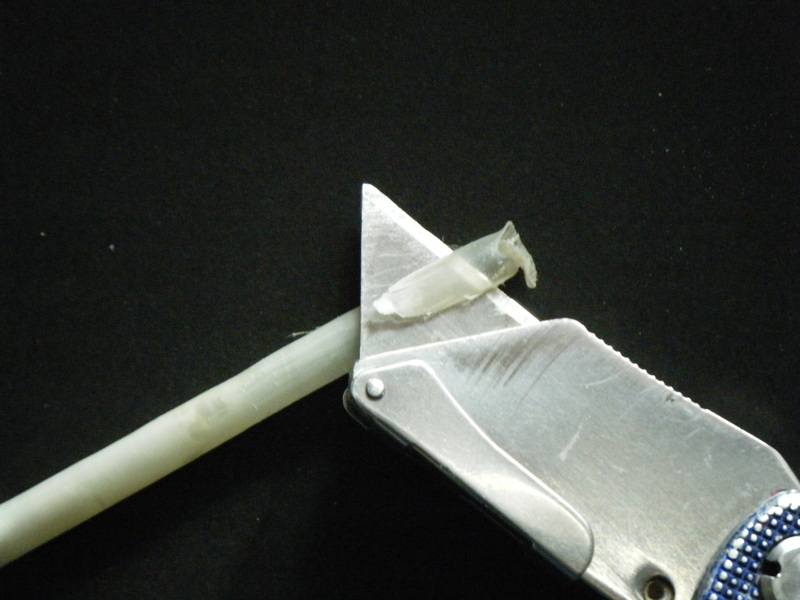 Once you are satisfied with the shape of the quill tip then split it up to 1 cm. Your quill is now ready!